I want to blame school for my subsequent lack of reading, but the truth is probably much more mundane. Certainly, I read throughout high school and college, usually assignments. I even liked some of the books, carrying those memories forward as I chose books for further reading decades later. Well, I didn’t really feel like committing to any novels. Or anything really. Slowly, it got better. I learned to manage time and funds and eventually found myself sitting around the apartment looking for diversion. I remember facing one long night and wondering if anything in the place could possibly provide entertainment for a few hours. (We had no television reception.) 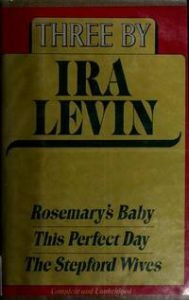 Skimming our books for something of the proper length and adequate interest, I found a collection of three Ira Levin novels. on the futon and started reading. That was how I spent the next few nights and finished the whole thing. While I can’t really blame anyone or anything for my dry spell as a reader, I can certainly credit one man with bringing me back to the fold. More than that, Levin set my mind racing again. I knew that I needed to get back to writing, but it seemed like such a chore to add to all the other challenges life seemed to be throwing my way. And the thing is that you can’t really think about making art if you’re not consuming art in the medium of your choice. I needed to be reminded how the words went together- how the story was constructed. And I picked an outstanding teacher for that re-introduction. Absolutely everything was there on the page to be studied. People often say “you know what you’re getting when you read…”- insert Ira Levin or John Saul or a thousand other names. What I hear when someone says that is that the style and structure are such a part of the artist’s DNA that they are putting themselves out there for everyone to see. Plus, they’re making it look so easy that some people feel comfortable denigrating the artist. Of course, Levin redeemed me with Rosemary’s Baby and The Stepford Wives and This Perfect Day as well as reminding me to experience art when and where I could. You’ve Got to Check This Out is a blog series about music, words, and all sorts of artistic matters. It started with an explanation. 52 more to go.